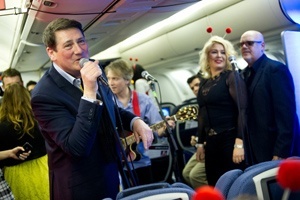 British Airways has achieved a Guinness World Record with a gig in the sky event featuring Kim Wilde and Tony Hadley. Part of British Airways’ Flying Start campaign, the gig in the sky on 10 March was in aid of the latest Comic Relief Red Nose Day, which takes place on Friday (15 March). Event production company Penguins provided audio visual and lighting production for the gig, which achieved Guinness World Records for ‘highest concert’ and ‘highest Harlem Shake’. British Airways staff took a step back in time dressed in 80s flight uniforms, reflecting when Red Nose Day launched. Penguins managed the production in the airport lounge, alongside performers Go West and Bananarama, ahead of the flight and on board the Boeing 767 aircraft. The height to beat was 42,080 feet high in the sky, which was set by singer James Blunt in 2010. The gig was hosted by Shane Richie, along with 80s stars Tony Hadley and Kim Wilde, who collectively managed to entertain the 128 passengers on board the aircraft reaching 43,000 feet setting a new Guinness World Record. Richard Bowden, Penguins production director, said: "We are very proud to be associated with this event for such a great cause and extremely pleased that we were able to bring our technical prowess to produce a live gig on a plane. "We needed to design bespoke battery packs tailored to the event that would be light weight and compact for safe storage during take-off and landing. Everything had to be carefully designed to meet both the limits of an aircraft and the specific needs of the artists. It was a successful show that we are delighted to be part of."